How did I end up foregoing my favorite marathon? Well, it started when this once early-March marathon I had already signed up for last year fell under new ownership and moved to President's Day. I remained in. Then, it was set to Memorial Day. Given my issues with heat (characteristic of May), I decided to drop out and had my yearly marathon be the Pasadena Marathon instead. It appears that many people did the same thing, as according to the LA Marathon site, under 15,000 runners finished the race this year. That number is usually well over 20,000. This leads me to the LA Coliseum where I was waiting with my bike before our 5:00 AM start. The difficulty of getting to that point at that time is nothing to be snuffed at, even for someone who wakes up before 5:00 am most of the time. They were very timely about starting us, so off we went. Basically, we went though the marathon route, with some slight deviations, particularly towards the end. The sights were pretty unbrilliant, as was probably the case for the runners as well. Residential and commerical areas of South Central LA greeted us, and it was generally too dark to see some of the views of the city that we got. My favorite parts of the race were those in which I was going down long downhills without pedaling with the cool wind hitting me. There were some inclines that seemed worse on a bike than they would be on foot. My gear-shifting skills have yet to be developed, but I noticed I was beating a bunch of road bikes on those hills. And generally, I was in synchonization with everyone in terms of when the gears were supposed to be shifted. There weren't really too many things of note with the other cyclists. Some blared music on their iPod speakers, some rode in tricycles, unicycles, and tandem bikes. I was a bit lonely seeing those tandem bikes because generally people don't do bike tours alone, yet there I was by myself. At one point, I saw one guy take a pretty bad spill, but he seemed okay. 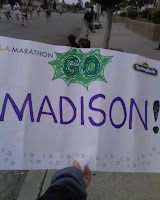 I was getting tired/bored at some point around mile 15, though I didn't have any way of knowing which mile we were on. I was pushing the pace a bit so I could get to my next task (keep reading for details). Anyway, before I knew it, everyone was stopped. I had reached the end. When I crossed the line, I looked at my cell phone for a time estimate. I think the course was only about 21.5 miles. 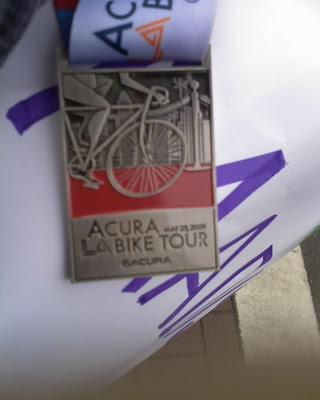 I dismounted and had to walk a tiring mile with my jelly legs and bike in a crowded field just to get my medal. The food was lacking, but once again, I needed to get to my task. 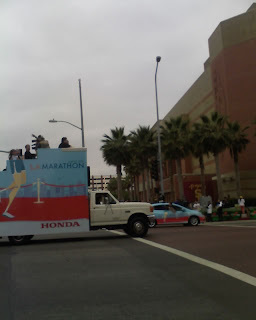 I was able to see the elite marathon runners at mile 3 (near USC). I haven't been a spectator in a race since before I started running, so this was definitely new. I took a picture of the head/lead vehicle (see left). I also saw a guy running in a testicle suit, but I did not realize what it was until the police officers commented on it. With my bike in tow, I was also carrying a sign for Tea Time. I had also written a similar sign for "The Ukrainian" on the other side. We spotted each other. I carried the sign up for quite a long time afterwards in hopes of seeing Tea Time, but figured I had just missed her in the small mob. A cheering spectator on Vermont and Olympic waits for [insert the embarrassing pet name I had written on the sign], her boyfriend. Also, she is waiting for her sister. I saw "The Ukrainian" come by. He was running much more slowly than I had seen him doing in the previous two meet-ups, but he seemed to look relaxed enough. I basically ran up to him for a high-five and some encouraging words. At that point, I had to high-tail it to the finish where he would soon reach. Although I was only two miles away, this was the worst part of my biking/spectating journey, as I had to go around a bit, mostly uphill, for a long time, and as I was nearing the point, I had to dismount and walk my bike among the crowded streets. I am so proud of the people I cheered for in this race, Tea Time for running a great time in spite of doing a marathon earlier this month, and "The Ukrainian" for exceeding his time goals. The whole time, I was somewhat jealous that I wasn't running, as it seemed fun and ideal running weather (for once). However, a part of me knew that I was not quite ready and that I would not have fared very well, anyway (beyond everything else, I was also having a bad stomach day, which didn't bother me much on my journeys). I guess I got my own unique experience touring LA (in all its non-glory?) on my bike. I realized how far I have come, since I am essentially what they call a "n00b" with bikes. But the medal pictured above is a reminder to me as to how far I've come. I hope to run LA Marathon next year, but given this course that I got to see for the first time on my bike, I don't know. I mostly like it because of the energy and the fact that it is so well-known. 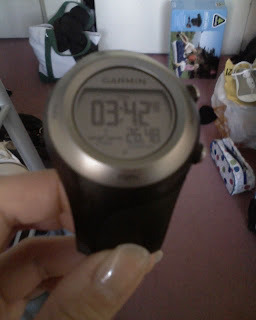 Finally, I added a pic of my Garmin that "The Ukrainian" had borrowed during the race. I'm sure it [my watch] knew that it was on someone else's wrist, as I obviously do not clock those sorts of paces/times. NOTE: There were photographers out on the Bike Tour route, so if I have any, I may post one here soon. The LA Marathon is currently scheduled for May 25, 2009, a poor choice of dates, in my opinion. It is likely to be too hot to be running a marathon.